I got caught in the rain the other day. Pouring rain. Cats and dogs rain. I was trying to run one block to the subway and thought I could make it...I was wrong. The whole time I was carrying a large paper bag of mixing bowls, mason jars, and sprinkles that I had just purchased (the sprinkles for these donuts, of course!) and praying to the paper bag gods that the bottom wouldn't give out underneath me. Luckily I made it, and in hindsight it was a very refreshing change of pace from my usual routine. Have I told you guys what my favorite donut shop is in Chicago? I have not? Oh silly me. It certainly is not Doughnut Vault, that place is infinitely overrated. It's a humble little place called Firecakes in River North. They make the most heavenly yeasted donuts, especially their Nutella long john. Oh em gee. It is the most amazing donut I have ever eaten and one day I'll figure out how to make it myself. If any of you live in and around Brooklyn, I would love some suggestions. I haven't really explored the donut shops around here yet (FYI I live in Cobble Hill), but I would sure love to hit up your favorite places. I love yeasted donuts so much. They are one of the few sweets I'll enthusiastically seek out, and I won't stop until I get my fill. Let me tell you though, I do not like cake donuts. They are not real donuts. They are not airy and soft and supple. They are a cake in the shape of a tube. Tube Cake. Gross. Just give me a slice of cake if that's the way it's going to be. It is yeast all the way, and these donuts I'm sharing with you rise absolutely beautifully. Hope you enjoy them as much as I do. 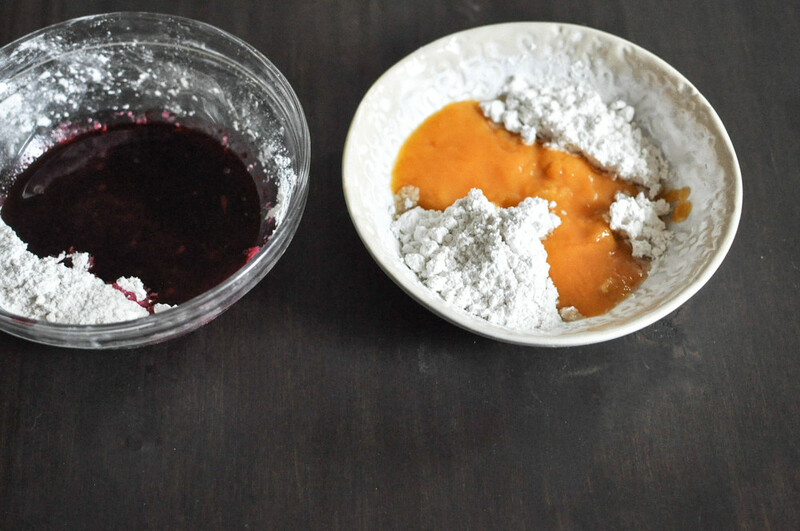 The glazes only taste slightly of blackberries and peaches because of the small ratio of fruit juice/purée you need for the confectioners sugar. If you want it to have a more concentrated fruit flavor, you could increase the amount of berries and peaches and cook the liquid down more. Donuts are best the day of. If you need to store them overnight, place them in a brown paper bag or box (like the ones you get from donut shops). Don't put them in an airtight container as the moisture from the donuts will cause the glaze to melt right off. In a medium mixing bowl sprinkle 1 tbsp yeast over 3/4 cup warmed milk. Wait 8 to 10 minutes until it starts foaming slightly, indicating the yeast has activated. Add 3/4 cup flour and stir until smooth. Cover and let sit at room temperature for 30 minutes. In the bowl of a stand mixer, add remaining 1 tsp yeast, remaining 1/4 cup milk, the flour mixture from above, egg yolks, and vanilla. With the bread hook, mix on medium low for about 1 minute until combined. Turn off mixer, add 1 cup of flour, sugar, salt, and butter. Mix again on medium low for another minute until well incorporated. Add the remaining flour 1/4 cup at a time, scraping down the bowl after each addition, until the dough clears the sides of the bowl. You may not need all of the flour. The dough should be very soft and supple. Cover the bowl and let the dough rise at room temperature for 30 minutes. After rising, punch down any excess air bubbles and transfer dough to a large, well oiled bowl. Cover again and transfer to the refrigerator for 2 to 3 hours. Take the dough out of the fridge and get a large sheet of lightly floured parchment paper ready. Transfer dough to a floured surface for rolling. Roll it out until 1/2 inch thick. 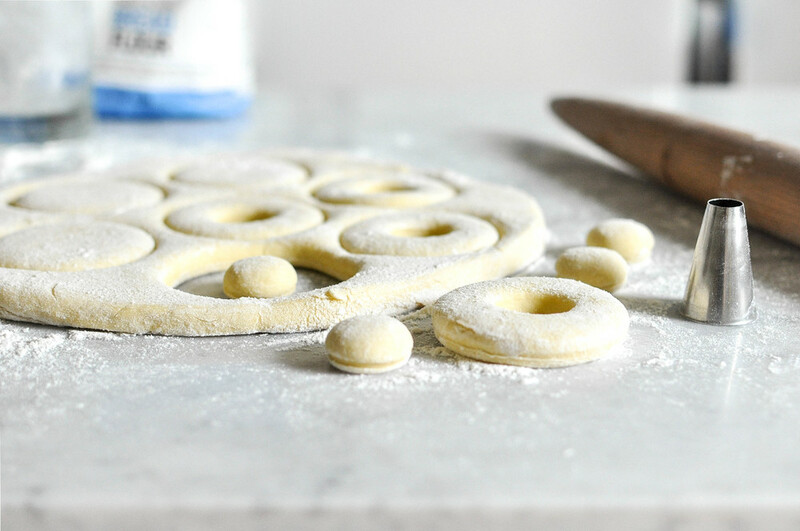 Taking a 3 inch cookie cutter (or an old fashioned glass) cut out a dozen donuts and transfer each one to the parchment paper. You'll most likely get 7 out of the first batch and have to re-roll the excess. When you re-roll the dough out, try not to trap any air bubbles in it as they'll become large pockets while frying and deflate when cooled. Taking the larger end of a medium to large piping tip, cut out the holes. Cover the donuts (and donut holes) loosely with plastic wrap and let rise at room temperature for 30 minutes. While the donuts are rising, make the glazes. In a small saucepan, heat up peaches and 2 tbsp water over medium. Simmer for about 8 minutes until peaches are tender. If there are still chunks, purée in a blender, then take through a fine mesh sieve. Transfer to a medium mixing bowl. Rinse out the saucepan and add blackberries and remaining 2 tbsp water. Bring to a vigorous simmer over medium heat and cook for about 15 minutes in order to reduce the juices down a bit. Strain through a fine mesh sieve and transfer to another medium mixing bowl. You should have about 1/4 cup of each fruit. Divide the confectioners sugar evenly between the two bowls and whisk each one until smooth and well combined. Add more confectioners sugar as needed if the glazes are too thin. They should be somewhat thick but not too thick, like the consistency of a light honey. Keep in mind that the glazes will thicken slightly as they sit. Set up a wire cooling rack on a baking sheet. 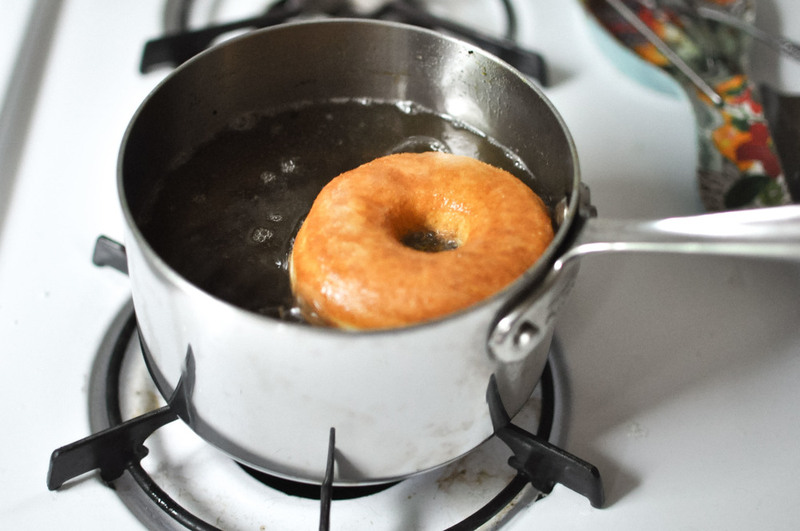 In a small or medium saucepan, heat up 1 & 1/2 inches of oil over medium heat until it reaches 360 to 375 degrees F. Transfer donuts to the hot oil one or two at a time using a fish spatula. Fry the donuts until golden brown, flipping once halfway through. They will bubble vigorously when first dropped in then subside as they brown. It should take about a minute or less per side. Transfer each donut to the cooling rack to drain after frying. After the donuts have cooled a little, dip in glazes in the combination of your choice and top with sprinkles before the glazes have had time to set. I did six blackberry glazed and six peach glazed. If you're savvy, you could probably have both glazes on a single donut! We respect your privacy. Your email will only be used for new blog post notifications and important blog announcements. Thank you for subscribing! You will receive a confirmation email shortly. You must confirm in order to be subscribed. Additionally, you can unsubscribe at any time using the link at the bottom of an O&O Eats email.